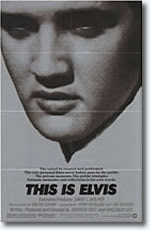 When I saw This Is Elvis at the movies in 1981 I thought it was great. I even remember they were playing Elvis songs through the speakers in the cinema as we waited for the lights to dim and the film to begin. 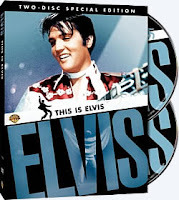 Yesterday evening I sat down to watch This Is Elvis again, this time on DVD. 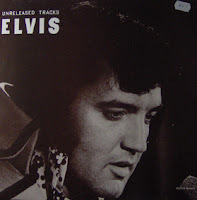 I still thought it enjoyable, although knowing a lot more about Elvis nowadays, I also spotted a lot of faults. The beginning is one of the highlights in the movie, with the camera following Elvis (played by impersonator Johnny Harra) inside Graceland and then up the stairs. In other words, you have a peek at how Graceland looked when Elvis lived there. In fact, I don't know of any other footage that shows the second floor of Graceland, and if only for that reason the movie is worth owning. In the expanded video version you also get to see Elvis bedroom and a glimpse of the bathroom. Another favorite part in the movie is the Elvis On Tour montage where the song "Promised Land" is used to great effect. I also like the scenes where Elvis is practicing karate to the sound of "Kung Fu Fighting." Then of course, there are the downsides. The worst by far is "Elvis" (Ral Donner) narrating the story of his life throughout the film: With a line like "If only I could see what was happening to me...then I might have done something about it," the movie reach rock bottom. Other annoying stuff are bad cuts in the songs to shorten their playing time, and the horrible way the ending of "Cant Help Falling In Love" is spliced with "Suspicious Minds." Another not to bright idea is to use footage from That's The Way It Is and pretending it's from 1968. I also have to mentions some terrible acting when it comes to a couple of interviews that clearly are staged for the movie. 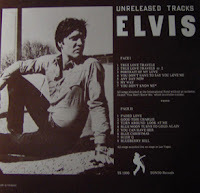 There's also quite a few bloopers, one example is when "Elvis" tells us he and Scotty and Bill tried to cut a record for six months at Sun, about 50 songs, before they got it right. Still, the inclusion of plenty of interviews, newsreel footage and home movies (the directors seem to have had access to tons of material) makes This Is Elvis interesting to watch, 27 years after its release. If you laugh at the mistakes there's still a lot to enjoy and also to be fascinated about. For example seeing Joe Esposito playing the role of himself and relive the day Elvis died. That must have been a strange experience for him. At first I felt slightly disappointed reading that the next FTD releases will be That's The Way It Is in the classic album series and a re-release of the CD originally included with the book The Way It Was. Especially since there's already the 3 CD Special Edition of TTWII and I have the book. But, as my brother told me on the phone today, let's wait and see, there isn't even a track listing out yet. And of course he's right, there might be a lot of interesting stuff on the classic album. Maybe some exciting studio outtakes and/or another concert. Still, I can't help thinking that it's been a while since a digipack FTD release saw the light of the day. Don't misunderstand me, I like the classic albums a lot. But I do miss "new" albums such as the last one, I Sing All Kinds, released in July last year. PS: I hope the next classic album after TTWII will be Good Times or Promised Land. How about you? In the latest issue of the magazine from The Official Elvis Presley Fan Club of Great Britain there's an interesting article called The "fair" side of Elvis. It's written by Albert Fisher, who in 1962 had the chance to hang out with Elvis during the filming of It Happened At The World's Fair. Albert Fisher, who was 21 at the time, held a position as head of Television and Motion Pictures for the World's Fair in Seattle. It was his job to talk film and TV producers into bringing their productions to the Fair, and then assist them while they were there. In the article, Fisher remembers his first meeting with Elvis: "I was impressed. I was a nobody and Elvis stood up to great me. Colonel Parker didn't budge...nor did he even hint at extending his hand." When Elvis was to resume the movie in Hollywood he asked Albert Fisher to be Technical Advisor on the film. Apparently, this was light and pleasant duty. Fisher writes that he would walk onto the set, take a look around and say: "Yep. This looks like the World's Fair." He would then hang out on the set or go sightseeing. In 1963, when the film premiered, Albert Fisher got his friends together and went to the first showing of the film to see his name among the screen credits. But as the credits began to roll he was heartbroken. Because guess who was credited as Technical Advisor? Yeah, of course, a certain Colonel Tom Parker. Still, Albert Fisher, now a well respected TV producer himself, treasures his time with Elvis: "I hold on to my memories of my brief time being able to pal around with one of the greatest entertainment legends in history...Elvis Presley." Visiting the Elvis Information Network website this evening made me realize that 35 years ago, yesterday, Elvis donned his American Eagle jumpsuit and made television history. Even if I don't think anniversaries like that are important, I tend to remember special dates in the "Elvis calendar" but this time it totally slipped my mind. Feeling a little guilty I decided to do a search on YouTube to see if there was anything interesting from the Aloha show. Punching in "Elvis Aloha" in the search field I struck gold immediately. Elvis must have felt on top of the world after the historical satellite broadcast. It's sad he never was presented with another challenge as big as that again, such as touring overseas. The news that Bill Belew has died made me think of all the jumpsuits he designed. 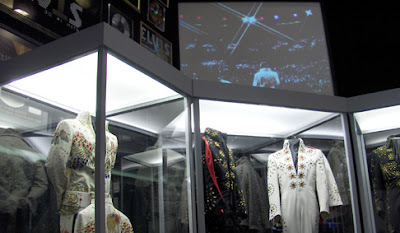 A lot of them are at display at Graceland, and when I visited there in 2005 it was an impressing sight seeing the most famous of them all, the American Eagle jumpsuit, together with all those gold records in the Racquetball court. Maybe you want to own your own Elvis stage costume? A while back Elvis Turquoise jumpsuit was sold for $210 000 on eBay, but if you don't have that kind of money you can get a copy nearly a hundred times cheaper here. Returning to Bill Belew, Elvis Australia has an interesting interview with him from 2005. Among other things, you can read about the laser suit he worked on at the time of Elvis death. 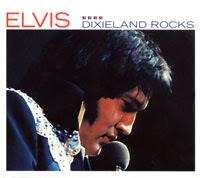 A very funny live version of "Love Me Tender" from Murfreesboro May 6, 1975, is included on the FTD release Dixieland Rocks. It begins during the familiar intro when Elvis sings a line from "I love little baby ducks" and then it just goes downhill from there. It's obvious Elvis is enjoying himself, and so are the women standing close to the stage trying to get a piece of the action. During the first verse, I think one of them receives a kiss in exchange for a stuffed animal of sorts. "God almighty," Elvis says, then "You just got a head, you ain't got no body," and after a loud kiss "I gotta take this animal." Then there is the second verse when Elvis just cracks up. There is no way knowing, but I think another woman is really climbing over the competition to get to him, and successfully reaching her goal, holds on tight. "Keep it up, honey" Elvis laughs and then there's the kiss. "You're beautiful," she screams and then "Oh, God," and in my mind I see her releasing her grip and falling back into the sea of women right in front of Elvis eyes. From then on Elvis laughs hysterically and there is no way he can continue the song. "That's it," he says, and after the ending exclaims: "I mean, she made me the hunchback of Murfreesboro, man!" Yesterday Elvis Unlimited could report that the Overton Shell in Memphis is undergoing a major renovation. The Shell, which is where Elvis made his first advertised appearance on July 30, 1954, was closed in 2004 and is to be reopened a few months from now. 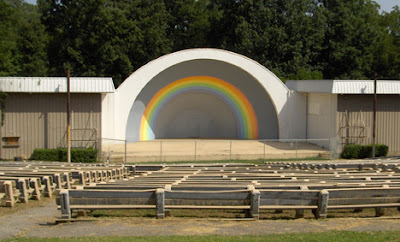 As this is historical ground to Elvis fans it's great news that the place will not be torn down. But at the same time it's a bit sad that it isn't restored to its original look - the Shell itself will be painted completely gold and the rainbow paint scheme removed. It was a special feeling standing there and looking at the stage where a pretty unknown Elvis (his name was misspelled "Ellis Presley" in one ad for the show) most likely sang both sides of his first single, more than 50 years ago. Being an Elvis fan means that I get a lot of Elvis related mail each year. The first parcel the mailman brought me 2008 contained the Memphis Recording Service/HMV UK single My Baby Left Me, released a couple of months ago. Actually, what I got was two records, as I'd ordered both the CD single and the 10" vinyl version. And it turned out a good way to start the new Elvis year. For starters, the singles are really good looking, reminding me a lot of the single re-releases from Sony-BMG you could collect in boxes. 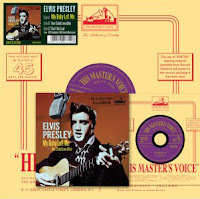 The only noticeable difference, at least on the CD picture cover, is that the label in the upper right hand corner reads His Master's Voice instead of RCA Victor. 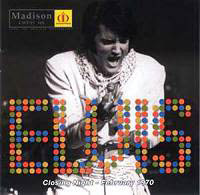 Moreover, the CD single includes a video track of Elvis performing "Don't Be Cruel" live in Tupelo 1956. 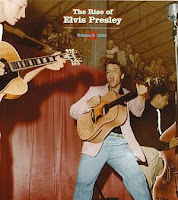 This footage can be found on the DVD Tupelo's Own Elvis Presley and is a nice bonus. And last but not the least, I got reacquainted with the song "My Baby Left Me." As Ernst Jorgensen puts it in his book A Life In Music: "The feel was close to that of the Sun sides." And the B side, "One-Sided Love Affair" ain't too bad, either! What could be a more suitable way to spend New Year's Day than to listen to Elvis Pittsburgh concert from the 31th of December, 1976? At least that's what I did on the train back home after celebrating New Year's Eve with friends and family. It really is a great show, and Elvis gives one of his best performances in a long time. The explanation for this, according to most authorities on Elvis, is the presence of his new girl friend Ginger Alden. Whatever the reason, the 16 409 people in the audience must have had their best New Year's Eve ever. 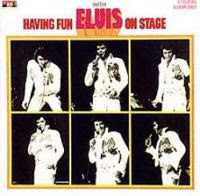 Listening to the audience recording from that night it's apparent that Elvis is in high spirits, singing songs such as "Reconsider Baby", "Unchained Melody" and "Rags To Riches." Finally, let me borrow Elvis own words from that legendary concert in Pittsburgh: I would like to wish you a very happy and prosperous new year!